This coin was designed and developed by MotorDog69. This heartfelt challenge coin is a one of a kind, made of solid brass, with a specialized antique nickel finish. 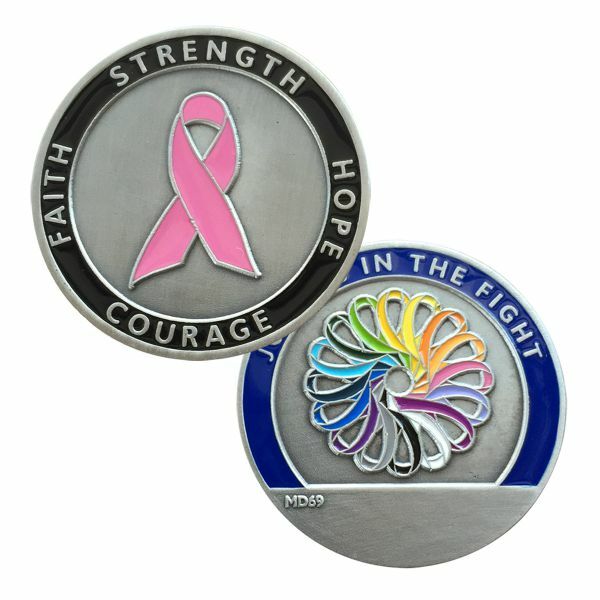 The obverse is the breast cancer ribbon with words of encouragement around the outside rim. The reverse is a pinwheel of cancer ribbons representing all cancers, each of its associated color. Included are the words "Join Us In The Fight", which we can all relate to... We also added an area for engraving a personal message. This unique coin will fit in any of our challenge coin mounts making your ride very personal.